(Bloomberg) -- For years Saudi Arabian oil ministers have said that the kingdom won’t balance the oil market on its own. That is pretty much what it’s doing now. By cutting output more than it pledged and promising to go even further next month, the world’s largest crude exporter is handing a free pass to producers elsewhere in the OPEC+ alliance and simultaneously yielding market share to the U.S.
Saudi Arabia pumped 10.213 million barrels a day of crude in January, according to figures published by OPEC. That compares with a target production level of 10.311 million, agreed in Vienna in December. And the kingdom doesn’t plan to stop there. Energy Minister Khalid Al Falih says it will remove a further 400,000 barrels a day of output in March, the Financial Times reports. 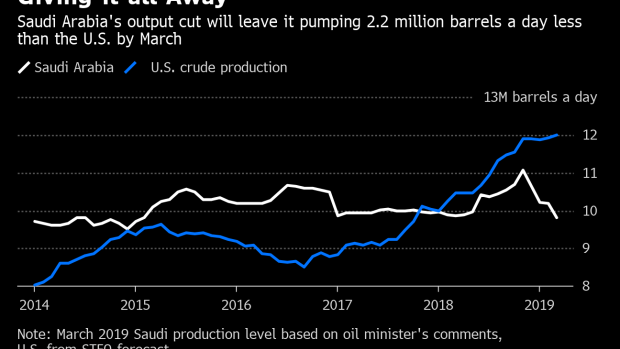 By March, the cut in Saudi supply would be 833,000 barrels a day from its October starting level, that’s bigger than the entire reduction agreed by the 11 OPEC members covered by the deal and 70 percent of all the OPEC+ cuts. That gives other producers in the OPEC+ group plenty of room to cheat on their output targets, while leaving the group as a whole on track to meet its pledge. The latest secondary source data from OPEC shows that fewer than half of the 11 OPEC countries met their output targets in January, the first month of the latest deal. The great Saudi giveaway is helping the wider OPEC+ group, too. Russia’s January output cut was just 40,000 barrels a day from its own October baseline, compared with a pledged 230,000 barrels. If Saudi Arabia follows through -- and there’s no reason to expect that it won’t -- it will take the country’s output to its lowest since February 2015. Come next month, Saudi Arabia could be pumping 2.2 million barrels a day less oil than the U.S. As recently as September 2016, the kingdom was producing 2.1 million barrels a day more. That’s a swing of 4.3 million barrels a day of production from Saudi Arabia to the U.S. in 2 1/2 years. The OPEC+ output cuts were originally meant to last just six months. The current deal, which runs to the end of June, extends them to five times that duration. And they may well be extended yet again, according to Algerian Oil Minister Mustapha Guitouni.